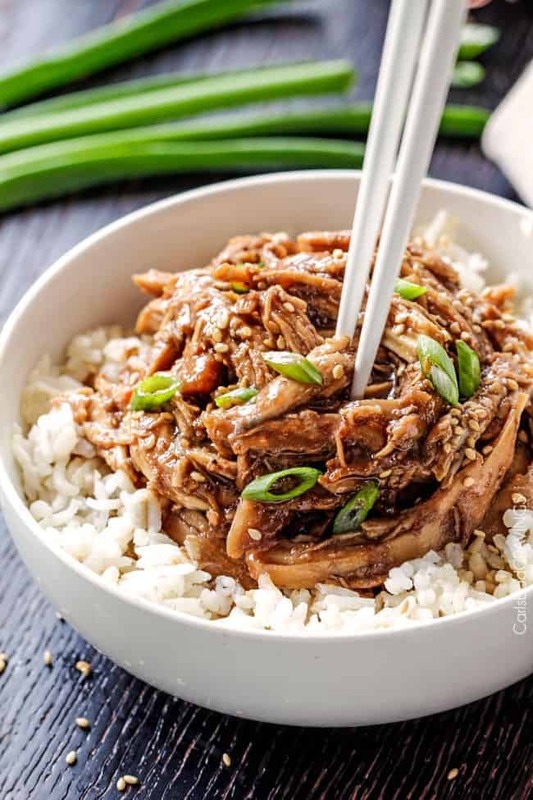 Slow Cooker Honey Soy Chicken is so easy and so delicious you will be wondering how you ever lived without it! I have been on a Slow Cooker kick lately – I just can’t get over the splendor of throwing ingredients into my slow cooker to simmer, soak and slurp up flavor and fill the house with tempting aromas all while I go about my day. From my Slow Cooker Mexican Chicken to my Slow Cooker French Dip Sandwiches, to this Honey Soy Chicken, I think I could live off of slow cooker meals for the rest of my life and be in complete multidimensional layered flavor heaven. 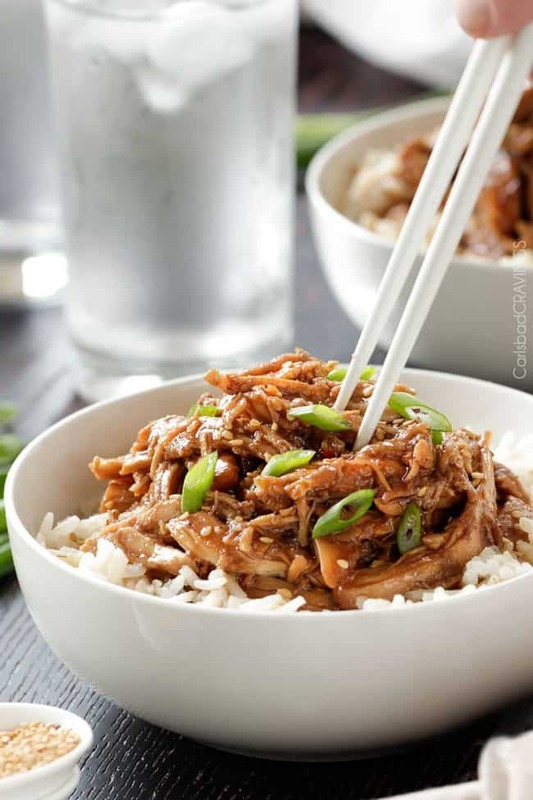 This Slow Cooker Honey Soy Chicken is my go to Asian Chicken. It is savory, slightly sweet with hints of Asian sweet chili sauce, garlic, ginger and my secret ingredient – blackberry preserves. Preserves might sound like an odd ingredient for Asian cuisine, but I use them often because they are absolutely delectable and a sweet yet full bodied flavor instead of just plain sugar – you will love the something- something they add to this cravilicous chicken! 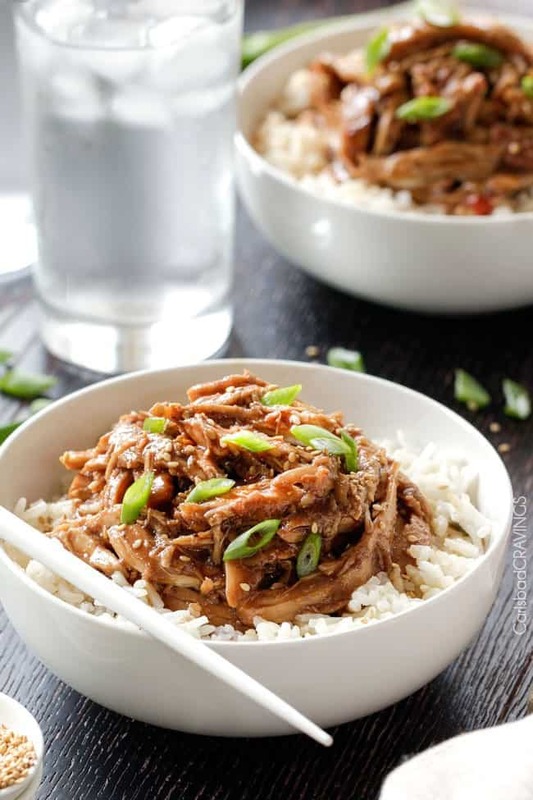 Now kick back, relax and let the Slow Cooker fill your home with the aroma of Honey Soy Chicken that’s about to become one of the easiest, tastiest dinners you’ve ever made! Rub chicken breasts with olive oil and place in the bottom of your slow cooker. Whisk Honey Soy Sauce ingredients together in a medium bowl and pour HALF of the sauce over the chicken. Refrigerate the other half until later. Cook on low for 5-6 hours or on high for 3-4 hours or until chicken is tender enough to shred. Remove chicken to a cutting board to shred. Meanwhile, strain any excess liquid from the slow cooker into a small saucepan. Whisk 2 tablespoons cornstarch with reserved refrigerated Honey Soy Sauce and add to saucepan. Bring to a boil then reduce to a simmer until thickened, stirring occasionally. Return shredded chicken to slow cooker and toss with thickened sauce. *You can find hoisin sauce in the Asian section of your grocery store. This post was written by a former contributor! Visit the about page to find out more about our current contributors! Ok, you’ve got me with the blackberry preserves thing, and black raspberry-blackberry instead can only amp things up, right? This looks great. One question – the listed ingredients calls for 1 1/2 T cornstarch, but the instructions says 2 T. Can you clarify? Sorry about that SC, it should be 2 tablespoons – just made the correction. Thanks!